Like people, dogs are susceptible to slipped discs in their spine. Intervertebral disc disease (IVDD) refers to a slipped or herniated disc. Any dog can be impacted by a slipped or herniated disc or intervertebral disc disease. It can be due to a spinal injury or another issue, and while there is no way to prevent it, you can reduce the risk and know how to best care for your injured dog. What Is Intervertebral Disc Disease in Dogs? IVDD is what happens when a disc is herniated or slipped. Sitting in the joints between the spinal vertebrae is a soft cushion known as the intervertebral disc. These discs are pads between the vertebrae that act as shock absorbers. The discs can become displaced, collapsed, bulging or protruding, deteriorated, or ruptured or herniated. Depending on the exact cause, the condition could be referred to as intervertebral disc disease (IVDD), or a slipped or herniated disc. Due to the degeneration of the discs, it results in pain and neurological problems. The symptoms of IVDD will vary and range from mild pain, severe pain, to partial or complete paralysis. 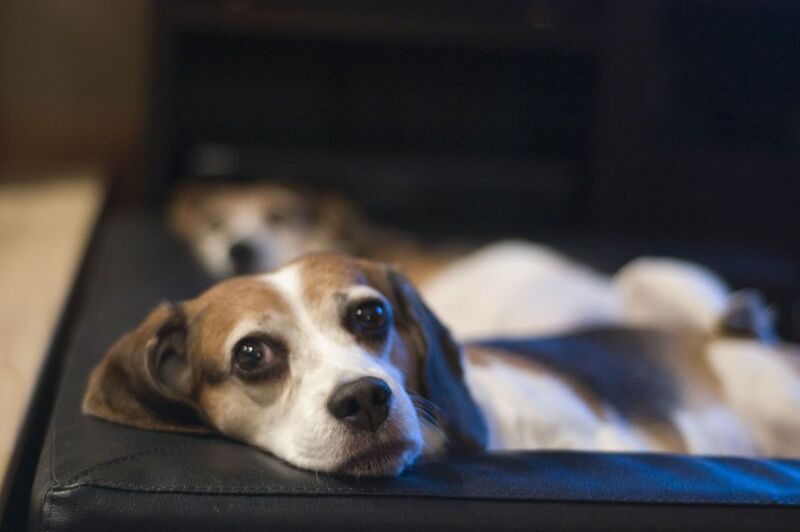 Disc disease is much more common in small-sized breeds such as dachshunds, Chihuahuas, beagles, and other small breeds. It can lead to an acute rupture, sending the disc material into the spinal canal at a high velocity. In other cases, the material can seep into the canal, causing either only pain or a gradually progressive weakness and eventually paralysis. Depending on the location of the disc herniation, the patient may be paralyzed from the "waist down" (hind limb paralysis) or "from neck down" (unable to use any of the limbs). Hansen Type 1: This is a herniation of the disc that can happen quite suddenly. It is breed-specific and based on heredity skeletal deformities in the smaller breeds like dachshunds, Shih Tzus, beagles, Pekingese, poodles, corgies, and basset hounds. Hansen Type 2: This is a more gradual, chronic deterioration that affects other breeds and bigger dogs, including but not limited to German shepherds, Labrador retrievers, and Doberman pinschers. To best treat the condition, a vet must confirm that the dog is suffering from IVDD. This is done by a non-invasive CT scan or an MRI study. These are the most effective diagnostic tools, followed by contrast spinal studies. This is necessary to rule out other possible problems, such as a spinal tumor, meningitis, or other inflammatory diseases. If the disc has ruptured, the surgery is usually done right away while the patient is still under anesthesia. The procedure usually takes 1 to 3 hours and involves opening the spinal canal, scooping out the disc material, and controlling any bleeding. Unlike humans, there is no need to repair the damaged disc and the patient will be able to move normally once fully recovered. In these neurosurgical emergency cases, the prognosis for recovery varies. About 95 percent of the patients who can still feel the hind limbs can make a complete recovery if surgery is done quickly. Otherwise, the outlook is much less favorable. Since this surgery removes the pressure from the spinal cord, many dogs feel a sense of relief afterward. The surgical pain, which is less intense, is managed with balanced pain medications. Additional medications may be needed to relax the urethra so the canine can urinate normally, and antibiotics, especially if a urinary tract infection is diagnosed. Sutures on the back can be removed after two weeks, and many dogs can walk at that time, even if they stagger a bit. Just like people after spinal surgery, it can take several months for a complete recovery. Physical therapy at home or at a professional physical therapy facility can accelerate the process for many patients. If immobility and pain return, another surgery may be necessary. If your dog is reluctant to walk or exercise, lay down, or get up, or exhibits pain when picked up or jumping off of the couch, consult your veterinarian. Disc degeneration is a condition which most of these small breeds are born with so it is not entirely preventable. Because of this, the canine patient may be prone to IVDD. Like humans, dogs (and cats) are prone to joint and bone problems, especially if they are overweight. Maintain a healthy diet to prevent obesity, which can help prevent IVDD (and other diseases). Also try to limit the ways your dog can get injured. For example, if they ride in the car often, help them in and out to prevent odd or big movements that could injure their spine.